Optimum Nutrition ON chocolate100-percent Egg Protein is a dietary supplement with 30 Servings. Containing 22 grams of protein per serving and only 3 grams of carbohydrates. This supplement is low fat and sugar-free, contains aminogen, and is loaded with all 8 essential amino acids. Doesn’t contain lactose or aspartame. Nutritionist commonly refer to eggs as the Gold Standard for protein quality. Eggs contain all of the eight essential amino acids (the type that your body cannot make from other substances) and very high levels of total amino acids; especially important sulfur-containing aminos. Eggs are also readily digested and absorbed. As a lactose-free protein source, eggs are often more tolerable to people who have trouble with dairy foods. For these and other reasons, eggs have been a staple of bodybuilders’ diets since the beginning of the sport. The biggest problems with using whole eggs for a major source of dietary protein are the accompanying undesirables (cholesterol and saturated fat) and the inconvenience of trying to store and prepare them when out-and-about. Thanks to advances in egg processing, both of these limitations can be easily overcome. Using specialized equipment and sophisticated processing techniques, the cholesterol-laden egg yolk can be separated from the virtually fat and cholesterol-free egg white to yield a product that is nearly all protein. The liquid egg white protein is then spray-dried with an Instantizing agent to improve mixability and eliminate the need for refrigeration. At a Glance: Each scoop contains the nutritional equivalent of seven egg whites and only 100 calories Complete profile of essential amino acids, BCAAs, and glutamic acid Contains aminogen for enhanced protein absorption No lactose, sugar, or saturated fats Grams of protein: 24 Grams of fat: 0.5 Nutritionists commonly refer to eggs as the “gold standard” for protein quality because they’re very easily digested and contain generous amounts of all eight essential amino acids. Eggs are naturally free of lactose, so they’re also much more “forgiving” to athletes who have trouble with dairy foods or milk-based protein powders. Optimum Nutrition’s Gold Standard 100% Egg takes the benefits a step further by virtually eliminating the fat and cholesterol found in whole eggs. Each scoop of Gold Standard 100% Egg packs as much protein as seven egg whites and only 2 grams of carbs. By also making this formula instantized to mix easily, Optimum Nutrition may have elevated the egg to a higher status. 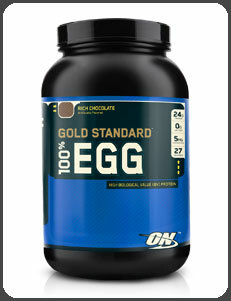 Optimum Nutrition Gold Standard 100% Egg, Rich Chocolate, 2 pounds.